An exoplanet a bit bigger and more massive than the Earth was just detected in the habitable zone of its parent star, which is located 41 light-years away. It was possible to measure both the mass and the size of this “Super-Earth”, called LHS 1140 b. It is about 7 times more massive than the Earth and 1.4 times bigger. It probably has a rocky composition, like the Earth. The star, LHS 1140, is a red dwarf, a star that is smaller and less luminous than the Sun (0.3% of its luminosity). The planet is really close to the star, and takes only 25 days to complete its orbit (the Earth, in comparison, takes 365 days – a year). Given the faintness of the star and the proximity of the planet, it is possible to evaluate that it receives about half of the energy the Earth receives from the Sun. 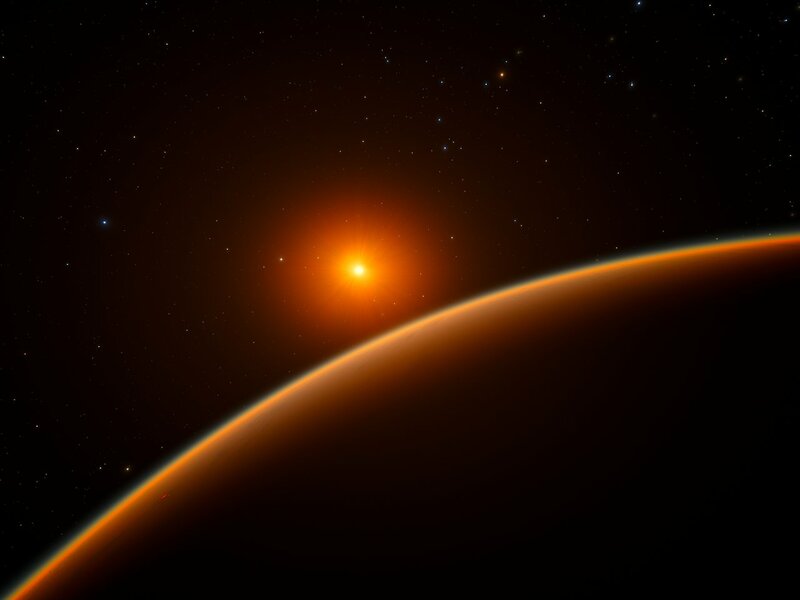 This places the planet in the habitable zone, a temperate region around a star where the surface temperature of a planet would allow water – if present – to be in liquid form. It is the telescope network MEarth-South, which was conceived especially to detect small planets around the closest red dwarf stars, that allowed to make this discovery. This network of small telescopes (40 cm apertures) is located in Chile, and uses the transit method to identify exoplanets. Night after night, the telescopes observe many different stars, looking for the characteristic small dimming caused by a planet passing in front of it. The size of the planet can be determined this way: the bigger a planet, the more it hides the luminosity of the star. The presence of the planet was then confirmed by the radial velocity method using HARPS, an instrument of the European Southern Observatory 3.6 m telescope, in Chile. This also allowed to establish the mass of the planet. Red dwarfs like LHS 1140 are really active when they form, they then emit a lot of UV radiation. This could have generated a runaway greenhouse on the planet, which would have lost a part of its atmosphere. It is however possible that the planet, more massive than the Earth, kept a magma ocean long enough so that volatiles such as water were protected in its mantle in the most active phase of the star. Additional observations will allow to determine which option is the more plausible, and to establish if the star has other rocky planets. What makes this discovery exciting is the relative proximity of the system. Just like in the case of the TRAPPIST-1 planets, which were announced in February, this will allow instruments that are currently built to study its atmosphere. The instrument NIRISS of Canadian Space Agency, which will fly with the James Webb Space Telescope, is particularly well suited to do so. René Doyon, professor at Université de Montréal and director of iREx, is the scientist in charge of this instrument. He confirms that LHS 1140 b is part of a very short list of exoplanets that will be studied first with NIRISS, as soon as the Webb Telescope is operational, in 2019.